An integrated vegetation management (IVM) plan could be the long-term strategy you need to keep hazardous plants and trees under control and resist invasions by more unwanted plant species. Beyond its safety applications, ACRT Pacific’s unique approach to IVM for the California climate conditions can also reduce your future costs and work requirements. ACRT Pacific foresters bring a unique and independent approach to IVM by taking the time to fully understand the vegetation challenges and extremes in your region to create a long-term plan that is the most cost effective method or right-of-way management to reduce your workload while having the least impact on the environment. 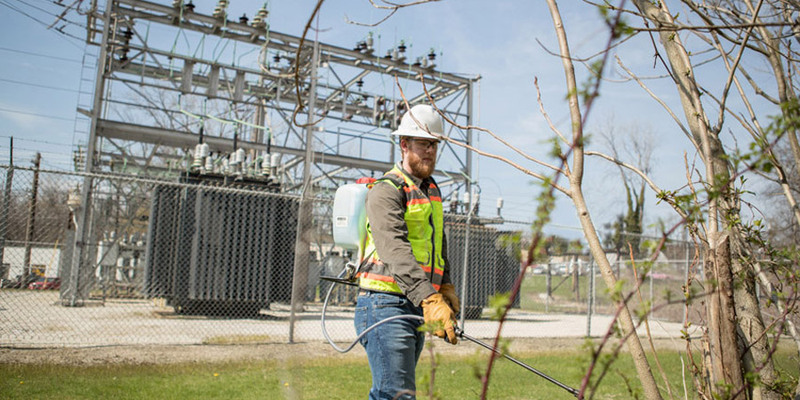 Our IVM approach is crafted around the types of plants and pests in your area that we identify to be hazards, and what can be done to encourage safer native species in your region and climate. Developing an effective herbicide program takes time and planning, and is based on following core best practices. Based on the density, height, and location of the vegetation, and the timing of the project, we’ll be able to determine what sections would best benefit from spraying herbicides and what should be cut down. Done correctly, IVM provides peace of mind when chemicals are sprayed, as it provides a natural refuge for bees and other insects who pollinate. The spraying of herbicides not only takes care of vegetation up front, but it also manages the problem long-term. You’ll be able to save money by having less maintenance done in the future, and with a stable plant community put in place, it reduces the risk that vegetation poses to your service.